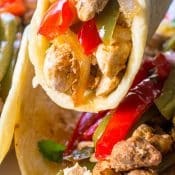 I have partnered with Honeysuckle White® Turkey to bring you these Easy Turkey Fajitas. As always, all opinions are 100% my own. Easy Turkey Fajitas make a delicious, healthy Mexican dinner that can be on the table in 30 minutes. By using either Seasoned Honeysuckle White®’s Seasoned Turkey Breast Strips for Fajitas or Honeysuckle White®’s Ready to Season Turkey Breast Strips, you can have dinner on the table fast! While I love fajitas, making them requires planning. It requires you to plan ahead to start marinating the fajitas the night before. If you want to use the slow cooker to make crockpot fajitas, you have to plan 4 – 8 hours ahead. What if you decide after work that you want fajitas for dinner but don’t want to go out to eat? What do you do? That is when you pull out the Honeysuckle White Marinated Turkey Breast Strips for Fajitas or Honeysuckle White Ready To Season Turkey Breast Strips for Fajitas. I love that Honeysuckle gives you the choice of whether to use the pre-marinated fajitas or whether to use your own fajita seasoning. I like using Honeysuckle White Brand Turkey because they have no added hormones or steroids and do not use growth-promoting antibiotics. In addition, they are raised by independent family farmers. I visited one of their turkey farms last year and saw the lengths they go to in order to raise healthy turkeys. On the East Coast, you will find them under the brand name Shady Brook Farms. You can use that pan on a stovetop, or on a grill, whichever you prefer. I like to cook the turkey fajitas with sliced red and green bell peppers, and sliced onions for even more flavor. For the Honeysuckle Ready To Season Turkey Breast Strips, I recommend seasoning them first with my Homemade Fajita Seasoning before adding them to the pan. Then prepare the same way as the Seasoned Turkey Breast Strips. 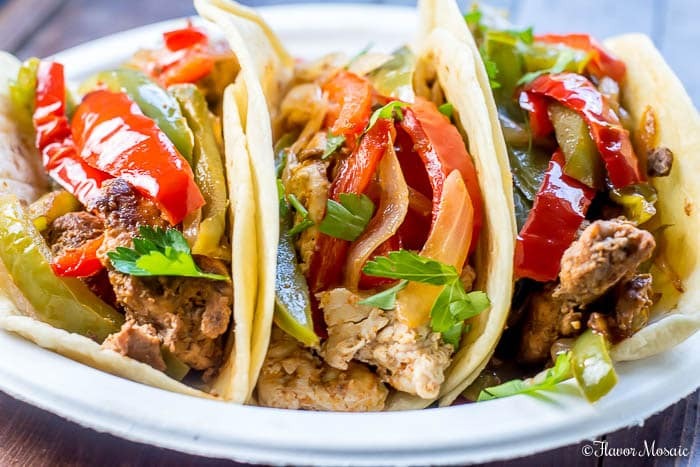 If you are not familiar with fajitas, the turkey fajita meat is typically served wrapped in flour tortillas (you could use corn tortillas as well) along with sauteed onions, and red and green bell peppers. Top the fajitas with your favorite Mexican toppings, such as sour cream, pico de gallo, cheddar cheese, chopped cilantro or guacamole. 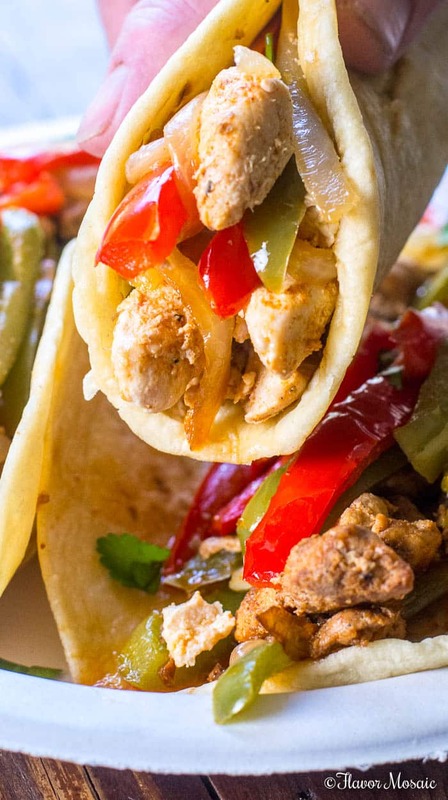 Cinco De Mayo (5th of May) is a perfect time to serve these Easy Turkey Fajitas. 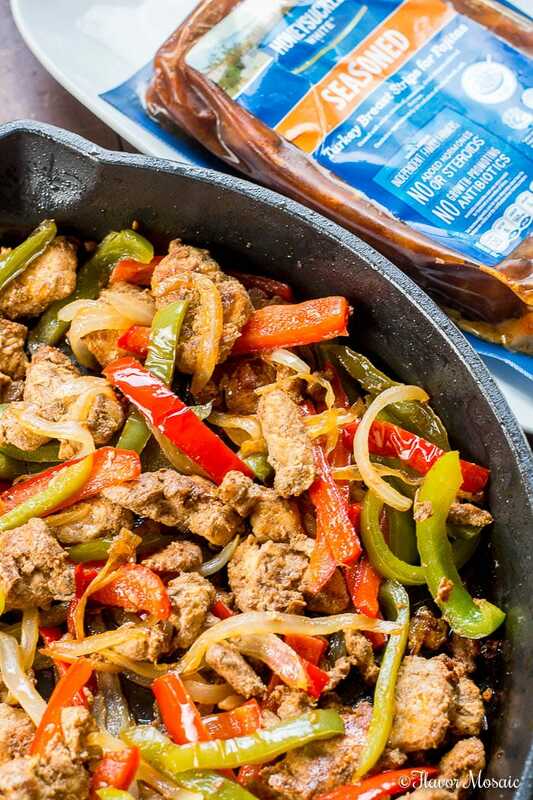 Create a Mexican Fiesta dinner with these Turkey Fajitas. They are so easy to make that you will have time to enjoy the party instead of slaving away over the stove. In addition to sauteed onions, bell peppers, and tortillas, round out your Cinco De Mayo menu with these other Mexican favorites! Guacamole – Fresh avocado with tomatoes, onions, garlic, and cilantro makes a creamy, zesty dip for your Mexican Fiesta party. Pico De Gallo – Fresh tomatoes, onions, jalapenos, garlic, lime juice, and chopped cilantro spice up any Cinco de Mayo party. Mango Habanero Salsa – Fresh sweet mangos combined with spicy habanero peppers make an extra sweet and spicy salsa for any Cinco De Mayo party. Mexican Street Corn Salad – This fresh, spicy corn salad is reminiscent of Elote, or Mexican Street Corn served with chili-lime cream sauce. Hurry! Cinco De Mayo is only a few days away! 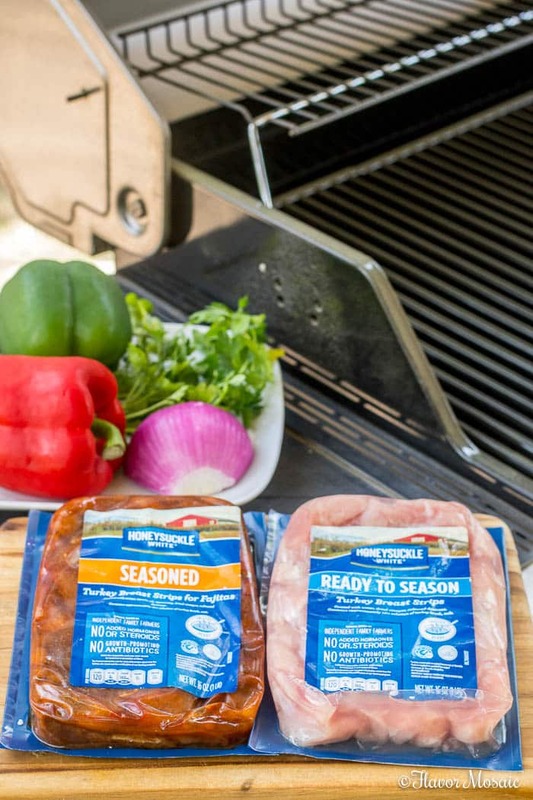 Head to your grocery store to pick up some Honeysuckle White Seasoned Turkey Breast Strips for Fajitas or Honeysuckle White Ready To Season Turkey Breast Strips for Fajitas to be ready for your Cinco De Mayo Mexican Fiesta. Follow Flavor Mosaic’s recipe board on Pinterest. Easy Turkey Fajitas make a delicious, healthy Mexican dinner that can be on the table in 30 minutes. By using either Seasoned Honeysuckle White®’s Seasoned Turkey Breast Strips for Fajitas or Honeysuckle White®'s Ready to Season Turkey Breast Strips, you can have dinner on the table fast! In a skillet over medium-high heat, add oil. Add the sliced onions and sliced red and green bell peppers. Cook for about 5 minutes or until the onions are soft and translucent and the bell peppers are fork tender. Remove onions and peppers and set aside. In the same skillet over medium-high heat, add additional oil. When hot, add the Honeysuckle White's Seasoned or Ready To Season Turkey Breast Strips for Fajitas and cook for 5 or 6 minutes. Turn the fajitas and cook the other side for about 3 or 4 minutes or until it reaches an internal temperature of 165 degrees F and is no longer pink. 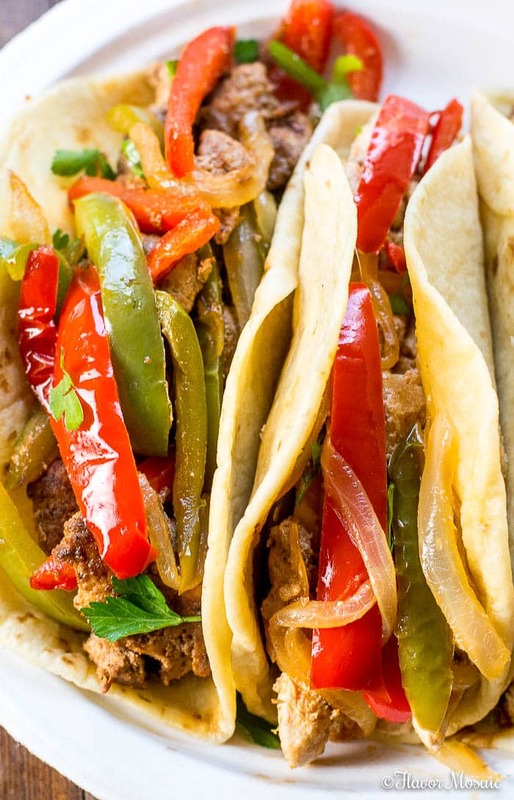 Remove the fajitas and serve with the onions and bell peppers in flour tortillas.